It’s easy to show your support for a mother’s whole health this May by taking part in the May Campaign. The May Campaign is the first national awareness effort spearheaded by the National Coalition for Maternal Mental Health to increase awareness of maternal mental health disorders. This year the theme is “Watching out for you“. Starting Monday, May 4th to Sunday, May 10th, the NCMMH is asking you to share our daily social media messages and to watch out for moms by hanging an awareness poster somewhere in your community. Through all of our efforts we can make a difference by breaking the stigma and raising awareness of one of the most common complications of childbirth. If you are interested in helping spread the word, you can download a poster like the one above, post it in your place of work or online, or share one or more of the May Campaign messages in social media. I plan on posting the messages from the PHA’s Facebook and Twitter, since I manage their social media as the Communications Chair. If you follow, PHA, it will be easy to reshare! 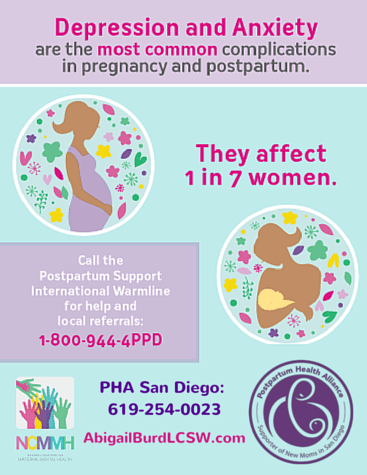 Poster courtesy National Coalition for Maternal Mental Health.